Lismore Castle has been the Irish home of the Dukes of Devonshire since 1753 and is possibly the most spectacular castle in Ireland. Situated in a panoramic position overlooking the Blackwater Valley it has views over rolling, wooded hills to the Knockmealdown Mountains beyond. Whilst being totally private, the Castle is on the outskirts of the Heritage Town of Lismore and a mere 200 yard walk to all its amenities. There has been a castle at Lismore ever since 1185 when Prince John built a “castellum” on the present site. When John became King of England he handed the Castle over to the Church and it was used as a Bishop’s Palace until 1589. In 1589 the Castle was leased and later bought outright by Sir Walter Raleigh. In 1602, when Raleigh was imprisoned in the Tower of London for high treason, he sold Lismore along with 42,000 acres for £1,500 to Richard Boyle, who later became the first Earl of Cork. Richard Boyle’s youngest son, Robert Boyle, the philosopher and father of modern chemistry, was born at Lismore in 1626. Lismore was considerably involved in the Cromwellian wars and in 1645, a force of Catholic confederacy commanded by Lord Castlehaven sacked the town and Castle. Some restoration was carried out by the second Earl of Cork (1612-1694) but from then until 1800 very little was done to the Castle by its owners. In 1753, the Castle and its lands passed to the fourth Duke of Devonshire following his marriage in 1748 to Lady Charlotte Boyle, the only surviving daughter and heiress of the fourth Earl of Cork (1695-1753). The sixth Duke (1790-1858), known as the bachelor Duke, undertook the most extensive restoration of the Castle. He was a patron of Dickens, Thackeray and, most importantly, Joseph Paxton (1801-1868) who joined the Duke’s establishment as under gardener in 1823 and became his friend and consultant in many spheres. Botanist, inventor, engineer, architect, town planner, and railway promoter, Joseph Paxton not only designed the Crystal Palace for the London exhibition of 1851, he also organised the army works and served in the Crimean war, and became a Liberal member of Parliament. Tsar Nicholas 1st of Russia knighted him in 1844 and he was later knighted by Queen Victoria in 1851. 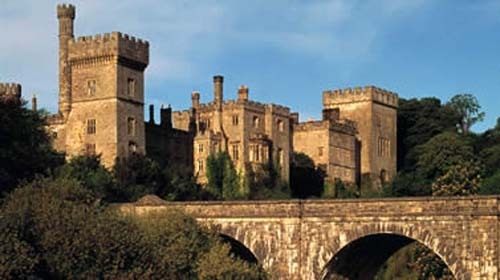 It was he who played a leading part between 1840 and 1858 in creating Lismore Castle as it is today. Adele Astaire, Fred Astaire’s sister, married Lord Charles Cavendish and lived in the Castle between 1932 and 1944. When her husband died she returned to America but continued to visit Lismore for a month each summer, during which time Fred Astaire was a frequent visitor. The present duke is Peregrine Andrew Morny Cavendish, 12th Duke of Devonshire (b. 1944). 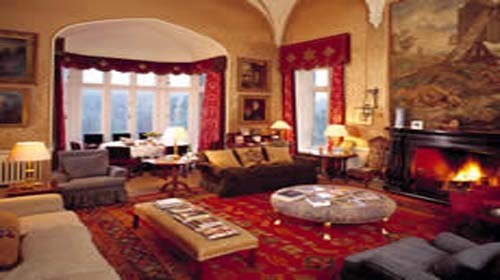 The accommodation consists of twelve bedrooms and twelve bathrooms and will sleep twenty-four guests. Breakfast, afternoon tea and dinner are included in the rate. Lunches and picnics can be organised if required. The lower ground floor has three double bedrooms with ensuite bathrooms, billiard room and games room. The ground floor has a drawing room, two sitting rooms, dining room (seats up to twenty-four), hall and Banqueting Hall (seats up to eighty) for large receptions, three bedrooms (two doubles, one twin), all with private bathrooms. The first floor has five double bedrooms and one twin bedrooms, all with private bathrooms. We pride ourselves on the level of cuisine and service which is exactly the same as when the Duke or his family are staying. We can also cater for wedding parties of up to eighty guests in the Banqueting hall. 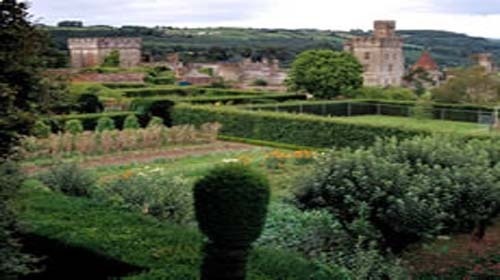 The historic gardens at Lismore Castle are divided into two very different halves. The Upper Garden is a complete example of the 17th century walled garden first constructed here by Richard Boyle, the 1st Earl of Cork, in about 1605. The outer walls and terraces remain and the plantings have changed to match the tastes of those living within the Castle. The Lower Garden was mostly made in the 19th century for the 6th Duke of Devonshire, Joseph Paxton’s patron. This garden is informal with shrubs, trees and lawns, and the stately Yew Avenue is much older, perhaps from the 17th century. 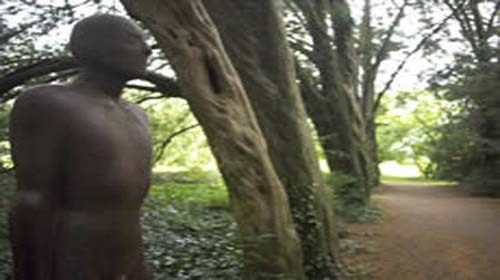 A new contemporary art gallery is open in the West Wing of Lismore Castle, Co Waterford. Cork-based architect Gareth O’Callaghan has sensitively and brilliantly reinterpreted the formerly derelict and abandoned wing. Borrowing from the Castle’s idyllic location and unique atmosphere, the gallery itself is nonetheless an entirely modern and exciting space, and conforms to international standards for exhibition and display. Lismore Castle is already renowned for the contemporary sculpture in its Gardens (currently receiving around 15,000 visitors per year between April and September), with works by artists including Anthony Gormley, Marzia Colonna and Eilís O’Connell on site.